I have lived in Beijing since September 2015. You hear the stories about this city having bad air but until you’re actually here, you have no idea how bad it is. I am an English teacher in a high school in the northwest of the city. My students know all about PM2.5, pollutants dangerous to health, and their answers to an exam question last year, ‘Should we put the environment ahead of all other concerns’, mostly included discussion of air pollution. Last December we even had three days off school because of the air pollution. Forget snow days, these were smog days. Even on the smoggiest days, you walk around the school and find windows open everywhere. Corridors have an eerie look as the smog seeps in, like something from Victorian London. You can see the swirling dust and dirt coming in and partially obscuring students and staff. Think of stories of Jack the Ripper or Sherlock Holmes. Charles Dickens even begins his novel Bleak House with a description of fog-bound London. Bouts of fog were common in Victorian London, as they are today in Beijing. Part of my PhD investigated the great London smog disaster, in December 1952. Some students even referred to the disaster in their exam answers, and it has also been mentioned briefly in some areas of the Chinese media when discussing contemporary air pollution in China. Last year, the Beijing government issued its first ever red alert for smog. It was this that caused the closure of the school. Before I leave my apartment I check keys, wallet, and smog mask – just in case. I suspect that my life expectancy has been reduced by living in this city, but everyone is in the same situation. Students come to class in masks; so do staff. There is a general sigh and shrug that the air is so bad, and you continue the best you can. I think the government is trying to solve the problem, but, often it isn’t pollution created in Beijing itself; it gets blown into the city and then remains, if there is no wind, blocked in by the hills that surround the capital. Imagine going to work every day. It takes you about thirty minutes to walk or take public transport, or even to drive. In London in December 1952, the air was so thick and so bad that journey times to and from work more than doubled; public transport was severely reduced or stopped working entirely, and few people went out in their cars because they could not see the road in front of them. 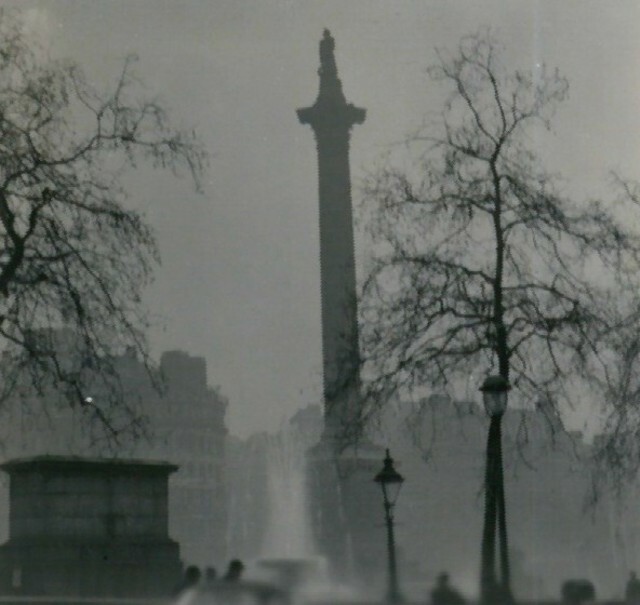 Nelson’s column in central London vanished before the eyes of Londoners, and some people supposedly fell into the Thames due to not being able to see the edge of it. Cinemas and theatres were not even safe, with the screens and stage also disappearing. In the days and weeks that followed, about 12,000 people died as a result of the smog. Good air days in Beijing, when it is clear and the pollution negligible, are savoured and enjoyed (when not working). But it not always the case. Perhaps because the air is so bad, you take every opportunity to go out and enjoy the good air when it does eventually arrive. I will be in this city for another year. I can only hope that in that time, the air does improve and the number of smog days falls. Mark Wilson completed a PhD in history at Northumbria University in 2014.